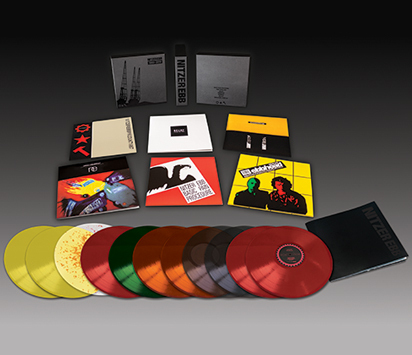 This career spanning retrospective box marks the first time that all five of the band’s albums for Geffen/Mute have been collected in one complete box set. The box set features expanded double colored vinyl, of each album, with several bonus tracks and hard to find 12” mixes, all carefully curated by Pylon Records and the original artwork expanded into gatefold sleeves, with embossing and spot UV finish. It also contains a large size 28-page booklet with linear notes by Douglas McCarthy and Bon Harris and unseen photos, flyers and artwork, detailing their entire career in chronological order from Essex to Los Angeles. These albums have been out of print since the early 90s and have never been reissued. This limited edition color vinyl is exclusive to the Nitzer Ebb box set, which is available only through the Pylon Records website.